It was a film at the 2015 AFI Latin American Film Festival that inspired my vacation in Peru. “Cooking Up a Tribute” is the story of the Roca brothers, owners of the famed El Celler de Can Roca in Spain. In 2014 they closed their restaurant for 5 weeks to seek gastronomic inspiration in three other countries, including Peru. I watch wide-eyed as ingredients like corn, potatoes, and chiles take on a life of their own, as they are infused with colorful stories of a people who are passionate about food. 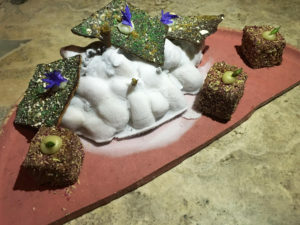 Peru is rising in popularity as a culinary destination, with three of the World’s 50 Best Restaurants, located in Lima. While many tourists visit Peru in order to scale Machu Picchu, my trip tips the scale in a different direction. 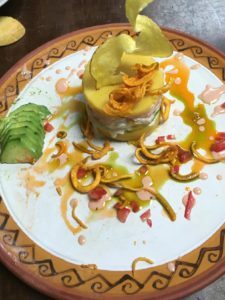 We work with Magical Cuzco Tours to design a Taste of Peru itinerary for our group of six which includes a market tour, cooking classes, and reservations at two of the aforementioned top-ranked restaurants. 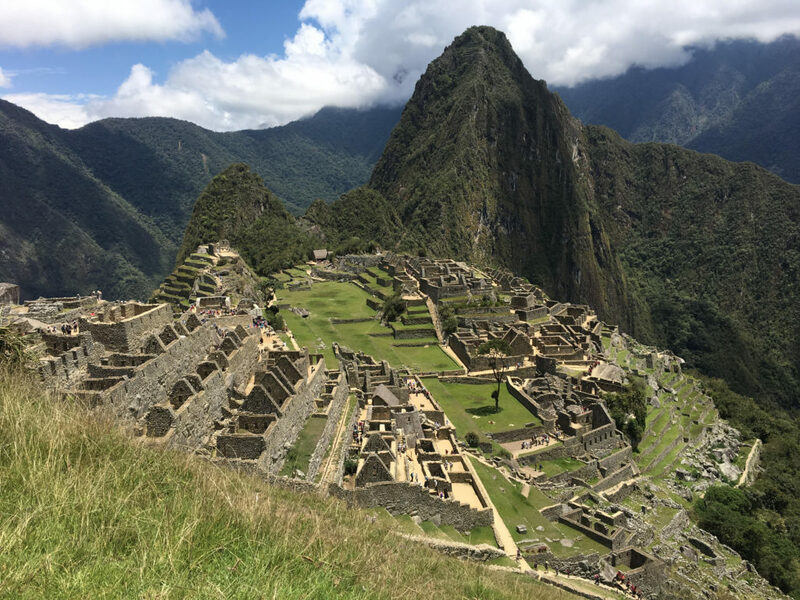 We also visit historic sites, including a mandatory but not-too-strenuous trek to Machu Picchu. 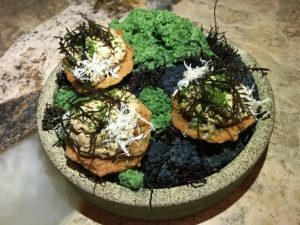 I gain a deeper understanding and respect for a cuisine that benefits from the richness of its terrain covering the sea, jungle, and mountains. The food is elevated by influences from China, Japan, and Spain, which weave into Peru’s fascinating history in various ways. After eight days of feasting, knowledge is not the only thing I gain. 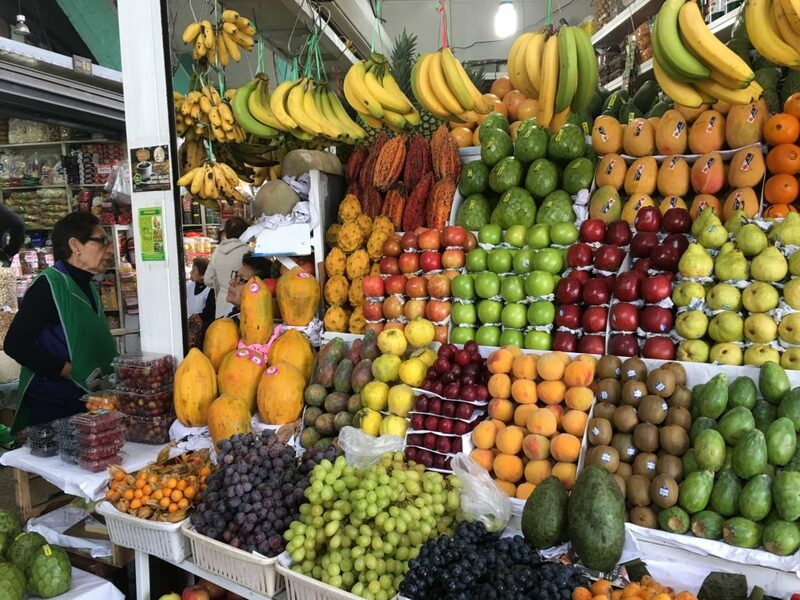 The Mercado Central or Main Market in Lima provides us with a fascinating study of exotic fruits. At first glance the fruit stands are similar to those in grocery stores at home. A closer look reveals a mélange of fruit in shapes and colors that are uniquely Peruvian. Some are sweet, others bitter, many have odd textures and deceiving tastes. Our introduction to Peru is an education in cherimoya, lucuma, pitajaya and tumbo which crop up throughout our stay in soups, desserts, main dishes, and beverages. Our journey truly begins here. We ascend the stairs at Maido, breathless with anticipation. The restaurant is ranked #13 in the world, an impressive rise from #44 in 2015. We are greeted by staff with a shout. “Maido” they chant, which is not only the name of the restaurant, but also a Japanese greeting. 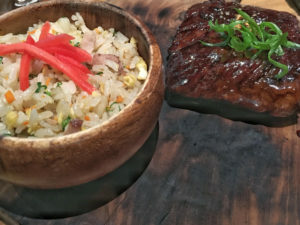 Chef Mitsuharu Tsumura wows diners with his innovative interpretations of Nikkei cuisine, which merges Japanese and Peruvian flavors, a reflection of a wave of Japanese immigrants into Peru in the late 1800’s. 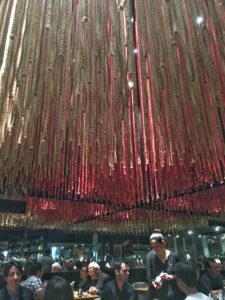 We are seated in the modern dining room, notable for a stunning vista of colored ropes hanging from the ceiling. 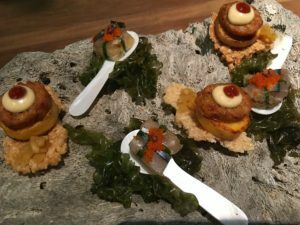 A meal at Maido can be experienced a la carte, or as a tasting menu. 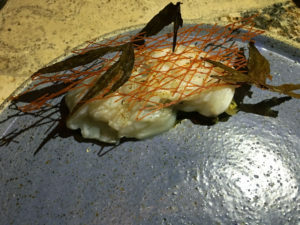 We partake in a 12-course menu titled “Maido 7 Years.” We traverse through a sea of dishes that incorporate local ingredients including roasted plantains, amazonic sausage, Peruvian corn, cuy (guinea pig), and a selection of seafood punctuated by ponzu, Japanese noodles, sake, mirin, miso, and mochis. Ceviche- a staple in Peru- tops our list of favorites with its combination of limpets (snails), smoked yellow pepper frozen in liquid nitrogen, avocado, Peruvian corn, and Japanese spices. Cod marinated in miso captivates us with delicate yet complex flavor. The fish is cooked over a wood fire and served with camotillo potato cream and crispy Bahuaja nut. The food at Maido soars – it’s imaginative, cohesive, creative and yet approachable. 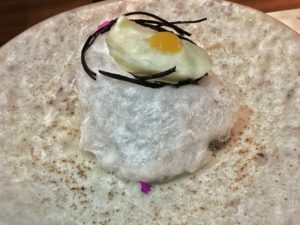 This is a restaurant that exemplifies why Peru has earned its reputation for gastronomic distinction. In the small sleepy town of Urubumbu in the Sacred Valley region of Peru, we make our way through a path of narrow streets, our guide depositing us in front of a rustic entryway that has us pondering what lurks within. We are at El Huacatay for a cooking class with chef/owner Pio Vasquez de Velasco. We are escorted to a porch just outside a small building, where a table, rudimentary cooking equipment, mise en place for causa (a classic Peruvian potato dish), and the gregarious chef Pio await us. We learn to make causa, which consists of mashed yellow potato mixed with key lime, onion, chilis and oil. The potatoes are spooned into a circular mold, serving as a makeshift bun for fillings that typically include avocado, tomatoes, and an optional toss of seafood. Pio schools us in technique and presentation. We learn to make mayonnaise, which we realize is nothing at all like the Hellman’s we grew up with.We top our creations with architecturally appealing plaintain chips and artistic squiggles of sauce. At the conclusion of our instruction, we are seated in the garden and invited to order lunch off a captivating menu that is pages long. El Huacatay Causa (made by one of my friends- mind didn’t look this pretty) – Dishes by Seminario a local artist. The dishes at El Huacatay showcase regional specialties like alpaca, quinoa, potatoes, and fresh seafood. Chef Pio transports the ingredients to stunning heights with creative twists. Some dishes are akin to modern American cuisine, such as pumpkin-orange cream soup with blue cheese and glazed chilies or coconut coated shrimp with mango chili dip. Others are more uniquely Peruvian including a terrific sweet potato ravioli in huacatay sauce with dried tomato, Andean cheese and crispy sweet potato threads. The pasta appears to drown under the weight of the sauce, but a spoonful of the luxurious topping has me eagerly diving back for more. It’s tempting to succumb to fatigue without reaching the summit, but it’s critical to forge ahead with dessert here. 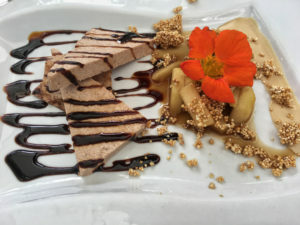 Cinnamon parfait with sautéed apples in pisco and malt beer is a sight to behold. It’s not a typical parfait, but the dessert is relatively light and not overly sweet. 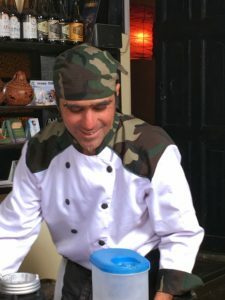 The Peruvian born Chef Pio spent time spent cooking in Germany where he met his wife, but moved back to Peru with his family when an opportunity to open a restaurant presented itself. Urubumbu is lucky to have him. 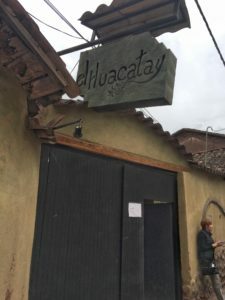 El Huacatay is an enchanting mix of tradition and innovation, a worthwhile destination in an absolutely stunning part of the country. Central in Lima is ranked #4 on the list of the World’s 50 Best Restaurants and #1 in Latin America. I have been conditioning myself for this journey to the top for many years. 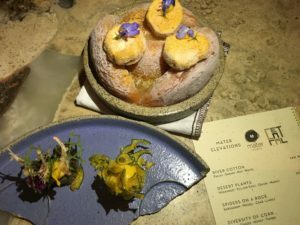 The tasting menu is entitled “Mater Elevations” and is an exploration of dishes organized by their distance from sea level. 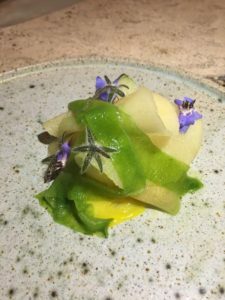 Chef Virgilio Martinez is a rising star in the international food world, and at Central his experimentation results in an exhilarating 16-course journey. Dishes bear names like Marine Soil, Extreme Stems, Low Andes Mountains, Andean Plateau, and Desert Plants. Each dish incorporates at least one element that we recognize with many indigenous ingredients that are completely unfamiliar. Some dishes like Diversity of Corn elicit exclamations of pleasure; others leave us pondering our true feelings about the flavors. Even dishes that don’t fully please my palate captivate me with their attention to detail and textural beauty. Chef Martinez is a superb craftsman who brilliantly showcases his country’s biodiversity through food. 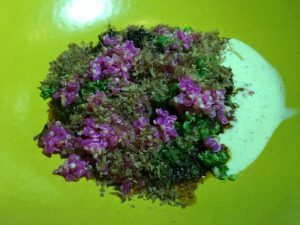 While our experience has minor blemishes, dinner at Central is transcendent… an absolute must for adventurous eaters. 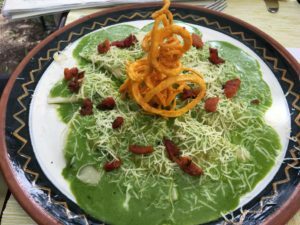 The food in Peru is astonishing, whether it’s discovered in a colorful market, stumbled upon in a small local restaurant, or sought after at one of the world’s top-ranked dining destinations. We visit the country in search of a peak experience, and find it in more ways than one.